HMV is shutting down all of its stores in Canada. According to legal documents obtained by the CBC, all remaining stores in Canada must cease operations by April 30. The majority of HMV Canada’s head office staff has been laid off, and the company owes its major suppliers, which include music labels and media studios, a reported $56 million as of December 31. In an affidavit, HUK 10 director Christopher Emmott said that “the debtor has been unable to reach an agreement with the major suppliers on mutually beneficial terms that would allow the debtor to address its immediate cash flow needs,” the Globe reports. 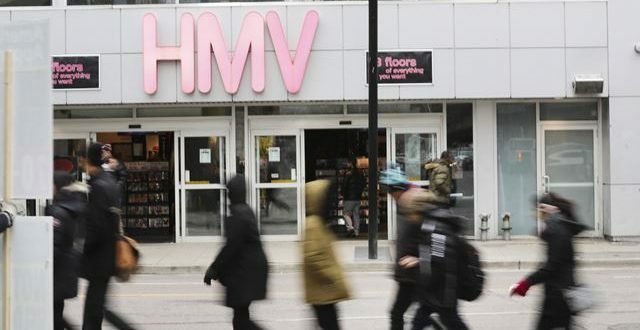 The continuous shift away from purchasing compact discs in favour of streaming has hurt HMV Canada, with the court filings also revealing that the chain has been losing money since 2013. At the end of 2016, its annual sales dropped from $266 million to $193 million. “As a result of the constant and significant shift in the way media is consumed by customers, especially in North America, the debtor has seen a consistent year-over-year decrease in the sale of physical media,” Emmott said. Unfortunately, this is not the first time HMV Canada has faced major trouble, as more than 100 HMV locations across Canada were sold to the private equity arm of Hilco International Holdings LLC back in 2011. After being purchased by Hilco, HMV expanded beyond sales of music to offer DVDs, music accessories and T-shirts. Emmott added that HUK 10 has received no cash payments from HMV Canada since November 2014. HMV first opened in Canada in 1986.